In today’s market, newer and flashier phones are released on an almost weekly basis. Each phone, it seems, supposedly has something that has never been done before integrated into it. This one has a sleeker design, that one has a fancier operating system, etc. However, one juggernaut of a company has not yet given in to the pressure to create phones that are nothing more than pretty gadgets.RIM, the company responsible for Blackberry phones, has decided to go a slightly different route than its competitors. Instead of dishing out a new phone completely different from those of the past, the new Blackberry Bold 9780 is simply a better made, slightly upgraded 9700.The Bold 9700 was a great phone itself, featuring a sleek OS, practical keyboard, and a processor fast enough to handle most anything you could do on a smart phone. It was received very well by reviewers, and though sales could have been better, it was far more than just a success for RIM. Many reviewers called it “the perfect business phone”, so how could it get any better?Along comes the Blackberry Bold 9780. On the surface, it’s simply the 9700 with a new paint job (if you purchase the dark version that is). Inside, the 9780 is well, a better 9700. A few internal upgrades were made, a new OS was made, and while this does improve the phone, these changes don’t seem to justify calling it an entirely new model. The 9780 is a well-made phone, there’s no doubting that, but on the outside, it’s the 9700 all over again. The same casing, same great keyboard, and even the same screen survived the jump from 9700 to 9780. It might sound like a bad thing to reuse old parts, but why make something new when the old is near perfection?This is certainly one of the easiest to use phones in production right now. The 9780’s keyboard is brilliantly accessible for any use. Many people find themselves writing novel length messages on it simply because it is such an ease to type smoothly and quickly without discomfort becoming an issue. The screen is also nice, featuring a perfect size for its function and never makes you feel like it’s too cramped.Carrying the Bold 9780 certainly garners a bit more respect than many other smart phones. Blackberry is, of course, the classic business phone. Its soft-touch exterior is not only a comfortable fit in your hand; it’s also a great, sleek looking phone.This is a phone for professionals, or at least for people who like to look like a professional. When someone sees you using your Blackberry, there’s a good chance they think you’re doing something important. Maybe you’re finishing up that report for your boss, or looking over your client’s proposal, who knows? All you know is, you’re not having any trouble doing what you need to do with the 9780. 9780 features a new, better camera that shoots with a resolution of 5 megapixels, quite an upgrade from the 9700’s 3.2 megapixel camera. This 5 MP resolution is perfect for the average person, and still holds up well against competitors almost two years after release.Video on the 9780 isn’t too shabby either, recording all of your life’s happenings at a whopping 640x480 resolution. OK, so you won’t be doing any camera work for James Cameron, but you will have a decent looking video to share with your friends and to post on Facebook, which is pretty much all you can do with a video phone no matter how good it claims to be.Want to play a game?Well, too bad. Blackberry never has, nor ever will be a phone made for game enthusiasts. At best, a large franchise, such as Need for Speed, occasionally makes a decent port for Blackberry to advertise their console or PC game.The biggest problem for game developers on this smartphone is that the Bold series of phones do not support Open GL graphics rendering.Long live the charge!Blackberry’s aren’t quite known for their battery life, but it looks like RIM decided to change that with the Bold series. The 9780 features a great long life battery for a smartphone, boasting up to 6 hours talk time, and 408 hours of life while in standby. Unless you use the smartphone almost constantly, you can plan on seeing the battery meter over 50% even after a long day’s use. It’s hard to go wrong with this phone, in fact, it’s nearly impossible. With this sleek design, the easy to use keyboard, and even the incredible web browsing, the Blackberry Bold 9780 is a force to be reckoned with. Unless you already own the 9700 or want to play many games, I highly recommend this phone as a reliable, professional alternative to childish smartphones plaguing the mobilemarket. Blackberry 9780 seems good choice for blackberry user and upgrade with current old blackberry. 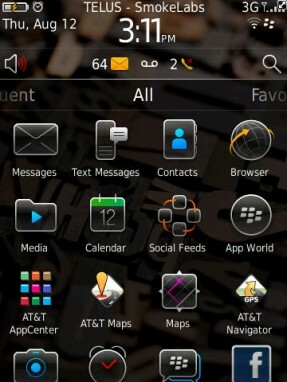 I would like to use the BB Messanger which is the best that BB have but it is really costly to use. But it provide the best security for your business interaction.